Last month I published a first demo based on the SPELL mini-BI solution, showcasing the ability to build multi-level drill-down charts. Today we are taking a look at the edit mode, thanks to an interactive demo. I think the best way to understand what this is about is to simply follow the link, read the instructions on the page, and start playing with the charts. Then you’re welcome to post feedback and questions here, and I’ll try my best to respond. The previous demo used the Google GeoChart API. 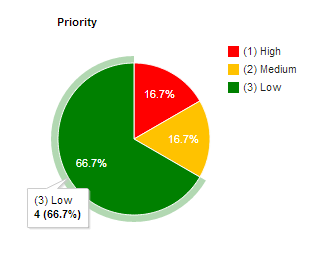 This time, the pie and column charts rely on the Dojo Toolkit. Dojo offers a wide range of charts, as well as multiple themes (I only picked a handful for the live demo). It also comes with plugins like animations and tooltips (also featured in the demo). The Matrix View is homemade, and part of SPELL. Here again, the data comes from grouped views (3 to choose from for the demo). This time I have only set up a two level drill-down, and clicking on a chart element will directly open the SharePoint list. I made a recent addition to the demo that I find interesting, I call it “client side calculated column”. It allows you to enter directly in the form a formula, similar to what can be done with calculated columns in SharePoint lists, just much simpler (currently only simple operations). In the demo, the “Value” field plays the role of the calculated column (see the context help for an example). I won’t describe this advanced customization in detail on my blog, but I’ll be happy to elaborate on specific points. If you think it could address your business needs, you’re welcome to subscribe to the SPELL interest list and you’ll receive in a couple weeks a sample to test on your own site. And if you are looking for a free, entry-level charting tool, remember to check out the SharePoint User Toolkit! To showcase some of the capabilities of the SPELL library, I have set up a live demo featuring airline ontime statistics. In this demo, you can explore data across 3 dimensions: State (first level), Month and Carrier (second level). The third level are the list items themselves. The first level is rendered via Google GeoCharts (for v1 SPELL will have other map options). The second level – matrix view – is a custom SPELL solution that mimics an Excel pivot table (much simpler though). You saw it in the slides if you read my previous post. “Real time” refers to the fact that data is directly pulled from the SharePoint list. The charts always read the latest updates, as opposed to traditional BI patterns where data transfers are done at regular intervals. And there is no need for intermediate storage, as would be the case for Excel Services for example. Note: for practical reasons the demo takes some shortcuts. For example the map doesn’t collect data directly from the list. I collected the airline data (January to July 2012) from the Bureau of Transportation Statistics, I’ll add August as soon as it becomes available. Obviously interacting with more than 3 million items would not be reasonable, so I have done some pre-processing to aggregate the data by month and state. This brings the number of items down to ~500/month, for a total of 3,500 since the beginning of the year. This is the downside of this solution: because it directly interacts with lists, it is subject to SharePoint’s usual limitations, for example the 5000 item threshold on views in SP 2010. Technically the tool could work with much bigger data sets, but this would require some adjustments and might not be desirable. Can easily be implemented by an experienced end user. No server side install, files are simply uploaded to a document library. Direct, real time access to the SharePoint data (which means for example that it follows site, list and item level permissions). Pure html (no Flash or Silverlight), accessible from both desktop and mobile devices. This could for example be the ideal tool for a mid-size matrix organization, with multiple teams working on multiple programs. 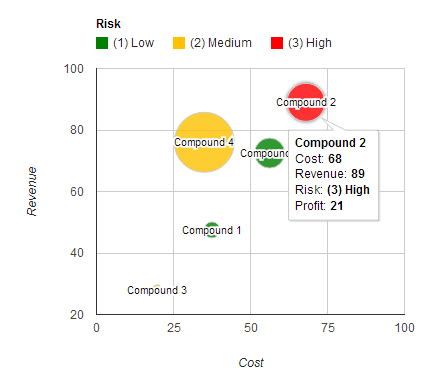 Managers could monitor the organization health, use the matrix view to analyze trends (what brings my organization up/down, a specific project or a specific team? ), and finally access the items themselves. I already mentioned it briefly in an earlier post: the SharePoint User Toolkit now includes a tool that allows you to add simple pie or bar charts to your SharePoint pages. The code is actually a connector that points to the powerful Google Visualization interface. For this reason, Internet access is required. Under the hood, the code works the same way as the Image Rotator: it retrieves data from a specific view of your SharePoint list. Proposed by Alexander Bautz, a client side charting solution for SharePoint that relies on the Google Visualization API. Author: Larry Pfaff, Sr Systems Analyst, Convergys Corp.
Can you see the finish line yet? As you remember in Part 1 we reviewed the requirements and expectations of the data. This output needed to be easy to read and use by all end users throughout the entire organization and most of the views returned the desired results. One advantage of using these views was no additional scripts were required to display data in table format with one column. Once we had a direction, in Part 2, we discussed some of the obstacles and limitations we ran into and how we overcame them. Although we are very close to completion there are still some details to review and modifications to make. For this all to work we will be adding the final parts (scripts) into a Content Editor Web Parts (CEWP). Begin creating a Standard view with the listed options. This should be fairly simple. If you need details for this you may go here. Added one column, which contained all the data for the table layout. Add a CEWP above your list view. This will contain the classes and formatting of the table. Be specific in the class names otherwise the formatting would be transferred to other parts of the page. There are several references available on the net to provide you with more details: HeatherSolomon.com is one of the most commonly used. Once you have added your CEWP to your list view you can add the CSS below. Initially my styles were off, which cause some formatting conflicts. Thanks Christophe for the style update for the table borders mentioned in Part 1. The key script to display the images, color and table layout can be downloaded here with instructions for installation. As I sat down to complete this final part in this 3 part series “Case study: course compliance report” I found IE and FF definitely don’t play well together. I also found there are several things I would do differently. With all the pieces placed together the results are astounding, but this is only one of many ways that scripts, intuitiveness and desire can produce outstanding results. One of the changes I thought about making was to the progress bar. Currently I am in the process of showing both Complete and Exempt on the same bar as one continuous bar like this. In theory this works. I can replicate it in a regular html table with div tags, but when implemented into a CC I lose either the color or the percent for the % Exempt. Will keep you posted on the progress, but for now I will continue to hack away until I figure it out. “More than the script we come up with, what is important is the innovative way in which we approach a real world issue”. Thanks again Christophe for your support. Guest author: Larry Pfaff, Convergys. I left off explaining how I went from raw data to manipulating views to achieve a table layout with usable results. Continuing forward I will describe how to achieve this output through the use of Calculated Columns (CC) in a custom list. It’s fairly easy to build a table in a CC with some simple HTML. I built my first test table with some test data and found it worked well. 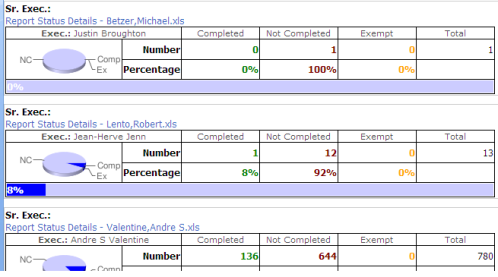 I began interchanging my test data with my list data until I hit a wall. The simple HTML table worked perfectly with test data, but when all my formulas replaced my test data it failed. Initially, I thought my formulas contained errors, but upon further research I found it to be the result of a character length limitation in the CC. I confirmed the formulas were correct piece by piece, but once I put them all together it was no good. This was very frustrating so I reached out to our SP Admin to inquire why this is happening. He stated something about the formula was too long and I couldn’t use it. Well, I am not one that takes no for an answer. So I began trying to figure out ways to reduce the size of my formula string. This is when I had two ideas for reduction. Go back to breaking the formula into usable chunks, leave them as separate CC’s and use a final CC to pull all the parts together. This result was very successful. In fact later research I found a single post “Calculated Column Limits (1024 Characters)”. Now that we have a work around for the size limitation we can discuss the fields and calculations. My list data was updating twice daily through the use of a macro in an Access database paired with the use of scheduled tasks. Below is the list of fields used in my reporting requirements. The gray highlighted rows in the table below is my raw data automatically updated. Each CC will be described and what calculations were used, when necessary. Data type returned as Number with Auto decimals places. Simple field returning the summed value of three columns for a specific row. This is not a required field, but it was useful in providing a navigation method to the source data (numbers/details). Here I used an IF statement to build a hyperlink back to the original excel file stored in a local document library. The excel files were names according to the Sr Executive, making the hyperlink easier to build dynamically. “Ayers” the first name in the formula had the most line items. The report was so large my Access macro would fail trying to upload data into SharePoint. So I split the report into 3 separate files, this formula takes that into account and links to one of three excel files for Ayers. Data type returned as Number with 2 decimals places. % Not Comp Data type returned as Number with 2 decimals places. % Exempt Data type returned as Number with 2 decimals places. Another Idea came from a progress bars and adding color. Currently this CC totals [% Complete] and [% Exempt] as total progress. Because some new employees and upper management were exempt from taking the course Exempt could not count against the total. .
<div style='background-color:#0000ff; width:"&(([% Complete]+[% Exempt])*100)&"%;'>&nbsp;</div> <div style='position:absolute;top:0px;color:white;font-weight:bold;padding:0 0 0 2px;'>"&TEXT(([% Complete]+[% Exempt]),"0%")&"</div> </div></DIV>"
="<div><b>Sr. Exec. : </b> "&[Report]&"<table class='myboxed'><tr><th colspan='2'><b>Exec. :</b> "&[Name]&"</th><th class='twidth'>Completed</th><th class='twidth'>Not Completed</th><th class='twidth'>Exempt</th><th class='twidth'>Total</th></tr> <tr style='text-align:right'><td rowspan='2'>"&[Chart]&"</td><td  class='label'>Number</td><td class='comp'>"&[Completed]&"</td><td class='nc'>"&[Not Completed]&"</td><td class='e'>"&[Exempt]&"</td><td>"&[Grand Total]&"</td></tr> <tr style='text-align:right'><td class='label'>Percentage</td><td class='comp'>"&[% Complete]*100&"%</td><td class='nc'>"&[% Not Comp]*100&"%</td><td class='e'>"&[% Exempt]*100&"%</td><td></td></tr> <tr><td colspan='6' style='text-align:left;'>"&[Progress Total]&"</td></tr></table></div>"
Note: the styles used for the above classes will be provided later. Data type returned as Single line of text. There are several types of chart providers. At the time I was developing this I only knew of google charts. This CC was created for 2 purposes. 1. to return the data as a chart and 2. to save on character length and to be shared in the Table field. ="<DIV><img src='http://chart.apis.google.com/chart?cht=p3&chs=150x50&chd=t:"&[% Complete]&","&[% Exempt]&","&[% Not Comp]&"&chl=Comp|Ex|NC&chco=0000FF'/></DIV>"
Although we are not quite finished we are well on our way. In Part I we discussed the process that lead me to the table layout and styles described. In Part 2 we discussed some obstacles and work rounds to get the required results. In our final installment, Part 3, I will describe the CSS and scripts that provided the final presentation.